The City of Toronto has two “railways to nowhere”: the Sheppard subway and the Richmond Hill GO train. The Sheppard subway is 5.5 km long, has five stations, and connects to only one other rail line, the Yonge line. 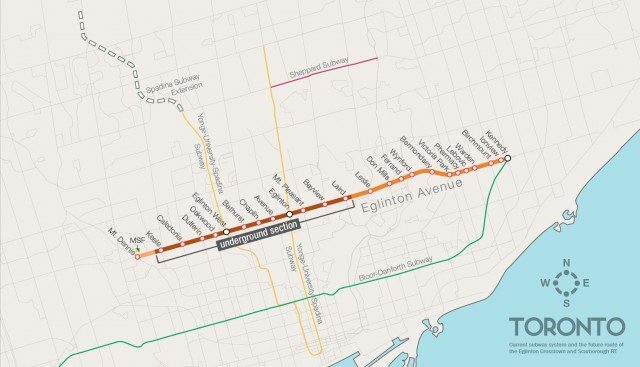 By comparison, the Yonge-University subway will soon be 38.8 km long (when the Vaughn extension begins operation), will have 38 stations, and will connect to many other rail lines, including the Bloor-Danforth subway, the Sheppard subway, 7 GO train lines (all at Union), and eventually also the Eglinton Crosstown. The Bloor-Danforth subway is 26.2 km long, has 31 stations, and has connections with other rail lines at stations like Dundas West (the Union-Pearson Express train and the Kitchener GO train), Main Street (the Stoufville GO train and Lakeshore East GO train) and Kennedy (the Scarborough RT*, Stoufville GO train, Eglinton, and, if the City’s current transit plans are realized, the Scarborough subway tunnel). Before the start of this year, the Richmond Hill GO train line was 34 km long and had five stations, three of which were located within the City of Toronto. With an extension to a new station, Gormley Station, having been opened in 2017, the line is now 42 km long, with six stations—but still only three in the City of Toronto. In contrast, the other six GO lines are between 50-103 km long (for an average of 69.6), have between 9-13 stations (for an average of 11.2), and have between 2-6 stations within Toronto (an average of 4). Winnipeg and Las Vegas, the two newest NHL franchises since Minnesota and Columbus joined the league in 2000, have one thing in common: nobody lives near them. Apart from much larger, regional capitals, like New York City or Phoenix, both Winnipeg and Las Vegas account for a far bigger share of their state or province’s total population than do any of the other cities with NHL teams. In other words, both Winnipeg and Las Vegas are located pretty much in the middle of nowhere. In spite of this, Winnipeg and Vegas represent opposing strategies to adding new teams to the NHL. Returning a team to Winnipeg was an example of what we will call a short-distance strategy. It was (to state the obvious) intended to capitalize on hockey fans, a.k.a. Canadians, who live in Winnipeg. As Winnipeg had been the largest Canadian city without a team, and Manitoba the largest province without a team, bringing the Jets back was an obvious decision for the NHL to make. The league does not, however, expect many people at Jets games to have come from afar. Even outside of Winnipeg’s metro area, most Manitobans live not far from the city. Winnipeg’s neighbours, moreover, are distant andd sparsely populated. Saskatchewan has just 1.1 million people; its largest city, Saskatoon, is 710 km away from Winnipeg. Calgary and Edmonton are 1200 km from Winnipeg. Fargo is 330 km to Winnipeg’s south, Minneapolis 615 km. And almost nobody lives in northwestern Ontario. Toronto and Ottawa are more than 1700 km away. Manitoba cannot rely much on its neighbours to buy hockey tickets. Las Vegas is following the opposite strategy: a long-distance strategy. It hopes to attract fans (aka gamblers, tourists) from hundreds or thousands of kilometres away: from Canada, the rest of the United States, and even overseas. Even the Vegas locals, who the NHL hopes to convert into hockey fans, are dependent on long-distance tourism. Without tourism, Las Vegas’ economy would dry up and force many of the locals to leave (or at least, to spend less money on hockey tickets). This the Las Vegas Golden Knights would not be able to afford. Once the Oakland Raiders move to Las Vegas in 2019, Nevada will have the smallest population per each of its major sports franchises of any state or province—with only one exception: Manitoba. This year’s Stanley Cup contenders, Pittsburgh and Nashville, are very different than Winnipeg and Vegas. For one thing, neither are the largest cities in their states. The Greater Nashville metro area is home to only an estimated 27 percent of the population of Tennessee; Pittsburgh’s metro area is home to just 13 percent of Pennsylvania’s population. Pittsburgh was fifth from the bottom on both of the blue graphs above. The Nashville Predators, and its nearest fellow teams in every direction—plus the Thrashers, which left Atlanta to become the Jets in 2011. For Nashville, not only are the Predators the only team in Tennessee, they are also surrounded by five states with no NHL teams: Georgia, Mississippi, Arkansas, Alabama, and Kentucky. Tens of millions of people live within a few hundred km of Nashville, and none of them have their own teams. Pittsburgh too is in a region with a large population yet relatively few hockey teams—albeit not nearly to the same extent as Nashville. This region includes Ohio, which has no team north of Columbus, and the Virginias, which have no teams at all. Most importantly, it includes part of southwestern Ontario. Pittsburgh is located closer to the Canadian border than any other American team apart from Buffalo or Detroit. Pennsylvania is also one of just two states that has exactly two NHL teams. (The other, Florida, relies on tourists and snowbirds, like Las Vegas will). This is a useful arrangement, creating an intrastate rivlary in which western Pennsylvania can cheer for the Penguins and the east for the Flyers. Pittsburgh and Nashville are both examples of a medium-distance strategy for NHL expansion. Whereas Vegas will rely on fans jetting in from thousands of km away, and Winnipeg relies on Manitobans keeping the seats full, the Predators and Penguins can both — in theory, at least — attract fans or ticket-buyers who live within tens or hundreds of km of their arenas. The question is however: which strategy is best? The reason I bring this up is, as the title of this article indicated, robots. If Sillicon Valley is right, and technologies like autonomous cars really are coming just around the corner, might this make a medium-distance strategy wiser? Would it make the recent expansions to Winnipeg or Las Vegas ill-advised? After all, an autonomous vehicle could make driving tens or even hundreds of km to come home from a game—at night, in the winter, on a rural highway, after having drunk a beer or two earlier—safe and easy. This might increase dramatically the distance that fans are prepared to travel to go to a game. A medium-distance strategy for future NHL expansion should, in general, prioritize cities that are in Canada or near the Canadian border. Such a team would allow Canadian hockey fans could come to games without having to travel too far a distance. Such cities might include Quebec City, Hamilton, Cleveland, Seattle, Milwaukee, or perhaps even Halifax, Saskatoon, London (in Ontario), Portland, or Toledo. Most of these cities could not support a team without some new major advance in transportation technology, such as autonomous cars: the number of hockey fans who live in them is simply too small. Some may not be able to support a team even with robot cars. Halifax, for example, has a mere 400,000 inhabitants. It would need to draw in many fans from other Maritime cities to become viable. While Quebec City and Hamilton are arguably the most sensible additions the NHL could make if following a medium-distance strategy, Seattle is I think the most intriguing one. Seattle is of course a sizeable city in its own right; it accounts for 50 percent (by metro area) and 9 percent (by municipality) of Washington’ population—middle-of-the-pack figures for cities that have NHL teams. Yet Washington as a state has only two major sports franchises (the Seattle Seahawaks and Seattle Mariners) for 7.2 million people. Along with neighbouring Oregon, Idaho, and British Columbia, the Pacific Northwest has only four teams (Seahawks, Mariners, Trailblaizers, and Canucks) for 17.5 million people. It used to have six, but the Supersonics and Grizzlies moved away. One reason the Pacific Northwest has so few sports teams per capita is its mountainous terrain. The mountains make land expensive, raising the cost of an arena. They also make driving tricky and limit the number of highways available, creating traffic. This makes it difficult for fans from other cities to drive to and from Seattle, Portland, or Vancouver to take in a game. For a Seattle NHL team this would be an especially important challenge, as the team would want hockey fans to visit from Canada. It is 236 km from Vancouver to Seattle, and 278 from Portland to Seattle. It is just 115 km from Victoria, BC’s capital city (with a population of 368,000), but only as the crow flies. Autonomous cars could, perhaps, help the Pacific Northwest overcome these challenges. They might do so by allowing an arena to be built further from Seattle’s expensive downtown core, or by allowing an arena to have much smaller parking lots (and therefore to occupy less expensive real estate) or by making it easier to drive hundreds of km through the region’s rugged and rainy terrain. Of course, it is easy for me to just say “autonomous cars” and then try to make up a cool-sounding argument around it. But that does not mean in any way that my argument is a good one. In this case, it may instead be that a short-distance or long-distance approach, of the Winnipeg or Las Vegas variety, really will be better than a medium-distance one. This is something that the league should, I think, try to determine for itself. If a short-distance strategy is determined to be best, then the obvious choice for expansion would be to put a second team in Toronto. Even with two teams, the municipality of Toronto would have approximately 1.4 inhabitants per NHL team and 700,000 inhabitants per “Big 4” sports franchise. In contrast, the municipalities of of Hamilton and Quebec City are home to only around 500,000 people each. The Greater Toronto Area (not even including nearby Hamilton or Kitchener-Waterloo) would have 3.2 million people per NHL team and 1.6 million per Big 4 team were it to add a second NHL franchise. The Greater Montreal Area would have just 2 million people per team were it to do so. A long-distance strategy, on the other hand, might focus on cities in the south, where hockey-loving snowbirds could flock. This could mean a first NHL team in one of the southern states without any, or a second team in Texas, or a third attempt at a team in Atlanta, or maybe even a fourth team in California. Indeed, the most recent round of NHL expansion in southern cities was during the 1990s, when, perhaps not incidentally, the cost of travel was cheap and the Canadian dollar was weak, as oil prices were at an all-time low. San Jose, Anaheim, Miami, Tampa Bay, and Dallas all got teams during 1991-1993 (Ottawa also got a team in 1992), while Phoenix, Denver, Raleigh, Nashville, and Atlanta got teams during 1995-1999. In contrast, the three since then have been northern: Columbus and Minneapolis in 2000, then Winnipeg in 2011. A long-distance approach, however, might be less friendly towards northern cities—particularly far-northern cities, such as Winnipeg, Quebec City, or Saskatoon. It might worry that too many Canadians will flee the cold and dark of winter to seek the bright sun of the south. The number 12 has played a key role in human culture, showing up in places as diverse as the hours of the day, the tribes of Israel, the disciples of Christ, the jury of your peers, the major gods of Olympus, the inches in a foot, the Chinese Zodiac, the Latin Zodiac, or the egg-carton. One reason for this is that 12 is divisible in three different ways: by 12 and 1, by 6 and 2, and by 4 and 3. Not until 18 (another significant number, in both Hinduism and Judaism) is a number again divisible in three ways. This is also the root of 13’s bad luck: it’s a prime number, divisible only by itself and one. 13 throws off 12’s groove. As in the case of the clock, calendar, and egg-carton, 12’s divisibility could perhaps be put to practical use in public transit. Imagine for a moment that a road were to have three different bus lanes in each direction. In one of the directions, busses on one of the lanes would make stops every 200 metres, on another lane every 400 metres, and on the third lane every 1200 metres. In the other direction, busses on one lane would make stops every 300 metres, on the second lane every 600 metres, and on the third lane every 2400. The result of this would be that busses on all six bus lanes would arrive at the same place every 2400 metres. In addition, busses on the 200 metre and 400 metre lanes would arrive at the same place every 400 metres, and busses on the 200,300, and 600 metre lanes would all arrive at the same place every 600 metres. Five of the six lanes — the 200, 300, 400, 600, and 1200 — would all arrive at the same place every 1200 metres. Lots of opportunities for passengers to transfer easily from one lane to another might therefore be created by such a transit system. Ideally, this would make the system both efficient and useful. Of course, you’ve probably already spotted the problem with this plan: roads aren’t wide enough for six transit lanes! In order to have a transit-by-the-dozen plan like this, you would need either narrower vehicles or wider roads. In the case of wider roads, the solution is obvious: use highways. The challenge then, however, would be how to get the passengers to and from those highways. This may not be viable today — or at least, not politically viable — but it could perhaps become so with the advent of autonomous or semi-autonomous cars. Autonomous vehicles could take passengers to and from transit stops located in or adjacent to the highways. The same might be said of narrower vehicles. Narrow, one-seater autonomous or semi-autonomous cars might allow main streets to create six narrow lanes — three in each direction — to be used for a transit system. Not only would the vehicles themselves be narrow, but they may also require less space between lanes. Alternatively, you could use only one lane in each direction, but still have different busses using the lanes stop 200,300, 400, 600, 1200, or 2400 metres apart. This would make the system possible on normal roads, with normal sized vehicles, rather than only on wide highways or with narrow autonomous cars. This is all enormously speculative of course. I don’t expect to see it happen, and am not sure it would even be desirable. I guess we’ll have to consult an astrologer to find out.